MRW brings you news from around the globe. 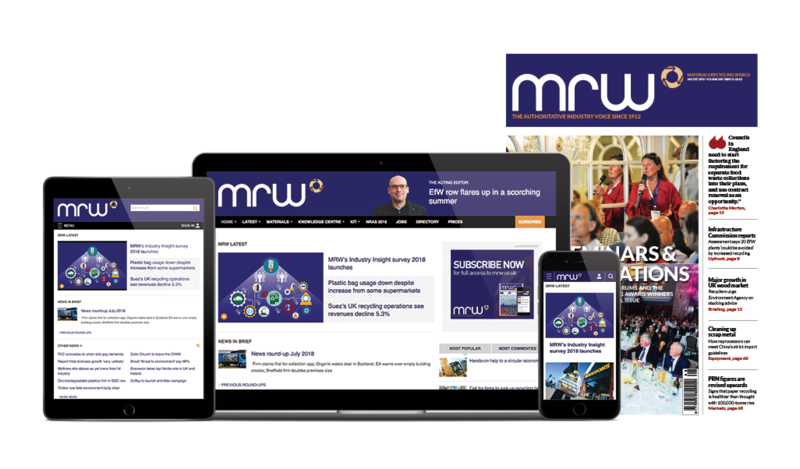 We gather top international markets, business and policy news that affect the UK industry. For more on each story, visit the links. The proportion of end-of-life tyres recycled or used for energy generation in Europe remained at around 95% last year, according to figures from the European Tyre and Rubber Manufacturers’ Association.There was a 3% increase in the number of scrap tyres generated when compared with 2010. In 2011, close to 3.3 million tonnes of used tyres were managed in an environmen- tally sound manner in Europe. After taking out those tyres going for reuse or retreading, most of the remaining stream went into material recovery schemes or energy recovery. The European Commission will be consulting on a revised list of indicators for measuring the EU’s resource efficiency. The list is about half the length of a provisional one included in the resource efficiency plan, which said targets based on the indicators would be agreed by 2013. The waste indicators now focus on municipal waste and greenhouse gas emissions are measured per capita. The environmental benefit of using recycled polyamide in automotive applications has been validated by a lifecycle assessment led by French engineering plastics developer Rhodia, automotive supplier Valeo and car maker Peugeot Citroën. The companies carried out a multi-criteria analysis on the entire lifecycle of a car fan and shroud assembly. The part is made by Valeo using recycled Technyl polyamide from Rhodia Engineering Plastics. French recycled pulp manufacturer Vertaris has been placed into liquidation. The decision was made by the Commercial Court of Grenoble on 24 July. Around 20 employees lost their jobs and a takeover was considered unlikely. The possibility of resuming production of de-inked pulp with new investors had been under discussion since December last year. Growth in Europe’s biofuel use slowed last year, according to figures which suggest that EU governments no longer see a “rapid increase” in the fuel as a priority. According to the EurObserv’ER biofuels barometer, between 2010 and 2011 biofuel consumption increased by 3%, with 13.6 million tonnes of oil equivalent used compared with 13.2 million the year before. The slowdown is particularly obvious in the transport sector, with 3% growth in 2010-11, down from 10.7% the year before. . The Association of Post- consumer Plastic Recyclers released a guidance document that provides information on dealing with the growing issue of full body sleeve labels on PET bottles. Sleeve Label Substrate for PET Bottles: Critical Guidance addresses several label design issues that affect the removal of labels in the recycling process, and quantifies the effects of label residue on PET bottle recycling. It is designed to help businesses select label substrates and materials that are more compatible with PET bottle recycling. According to data from Costa Rica’s national trade agency Procomer, the country’s scrap exports totalled 272,900 tonnes last year - a jump of 58% compared with 2010. The overall value of the trade climbed 44.4% to $38.7m (£25m). The main destination for Costa Rica’s overseas shipments was South Korea, which increased its purchases from 27,800 tonnes in 2010 to 146,600 tonnes in 2011. Other major buyers in 2011 were Taiwan (64,400 tonnes), Guatemala (17,600 tonnes) and Ecuador (7,200 tonnes). Producers and importers of electrical and electronic equipment in China will be required to pay into a fund to subsidise the cost of dealing with e-waste under a regulation jointly issued by China’s Ministry of Finance and five other departments. The fund is aimed at promoting comprehensive utilisation of resources, as well as encouraging energy saving and environmental protection. Under the regulation, the collection and subsidy criteria vary depending on the equipment. Thousands of demonstrators protesting against what they say is pollution from a paper factory in eastern China have clashed with police. Crowds estimated between 50,000 and 100,000 protested against alleged pollution from the paper mill, which belongs to Japanese company Oji Paper. Protesters overturned two cars and invaded local government offices in the coastal city of Qidong, near Shanghai, according to a news agency photographer. Following the clashes, a police blog said a pipeline from the mill would be “permanently closed”. Faced with a petition from environmental group ToxicsWatch Alliance, India’s Supreme Court ruled on 30 July that end-of-life ships containing hazardous materials, such as asbestos or PCBs, must follow the Basel Convention rules on global movements of hazardous wastes. This ruling means that India can no longer accept ships from Europe or the US. It also means that India must first be notified about all hazardous materials on-board, and must approve ship importation from all sources for scrapping before the vessel arriving in India. HeadingJapan’s ferrous scrap exports totalled 725,881 metric tonnes in June this year, increasing by 4.8% month- on-month and up 92.6% year- on-year, according to the latest statistics released by the Ministry of Finance. In the first half of this year, Japan’s scrap exports were 4.08 million metric tonnes, increasing by 68.8% year- on-year. In the first six months of the year, Japanese scrap exports to South Korea totalled 2.4 million metric tonnes, while exports to China amounted to 1.48 million metric tonnes, increasing by 81.5% and up 42%, respectively, compared with the same period of the previous year. The Recycling and Economic Development Initiative of South Africa (REDISA) reports that the Integrated Industry Waste Tyre Management Plan has been approved by the country’s minister of water and environmental affairs. The plan will be funded through a per-kilogramme levy on tyres manufactured in or imported into South Africa, currently R2.30 (18p) per kilogramme. The intention is to ensure that the management of waste tyres follows the waste hierarchy. MRW’s weekly round-up of news about recycling and waste management from around the world. MRW’s weekly round-up of news concerning waste management and recycling around the world.